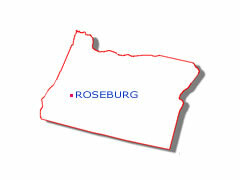 Roseburg is located on Interstate 5, approximately 125 miles north of the California border. Roseburg has a population of approximately 20,000 residents and serves an urban growth area of nearly 60,000 persons. The corporate limits of Roseburg encompass roughly nine square miles, at an average elevation of 465 feet above sea level. Click the city logo to the right for a map. Four of the nicest things about Roseburg are its seasons. Winters are cool without much freezing and provide most of the rainfall that brings blossom-filled springs. A warming trend begins in April and May, continuing into the summery days of July and August. Fall weather is pleasant and crisp, producing brilliant leaf colors in late October. The Hundred Valleys of the Umpqua have been compared geographically and climatologically with Italy and Southern France. Extremes of heat and cold are rare. The summer humidity is low and snowfall is rare on the valley floor. The normal growing season is 217 days. Roseburg enjoys one of the lowest average wind velocities in the United States. Roseburg is 80 miles west of Diamond Lake. Diamond Lake is at the crest of the Cascades. The ocean shores are approximately 70 miles to the west. Eugene is 70 miles north along Interstate 5 and Medford lies about 80 miles to the south. The South Umpqua River runs through town. It is noted for its summer small mouth bass and its winter steelhead fisheries. The South Umpqua River joins the North Umpqua River approximately 12 miles west of town. There are several scenic camping spots and points of interest close to Roseburg. Highway 138 leads to the east, adjacent to the North Umpqua River. and will provide a scenic route to the Cascades and Diamond Lake. The Umpqua Tribe of Indians occupied this area prior to the arrival of fur traders in the early 1800's The major westward migration in the mid-1840's attracted Aaron Rose, born 1813 in Ulster County, New York. He and his wife Sara came over the Applegate Trail. Aaron and Sara Rose purchased a claim that was originally platted as the township of Deer Creek in 1851. He envisioned a farming and commercial center flourishing here. A grist mill was opened that year on Deer Creek. The following year a post office and school were established. In 1854 Aaron Rose offered the county three acres of land and $1,000 for the county seat to be moved from Winchester. An election was held and three years later the town was officially platted and renamed Roseburg. Between 1865 and 1870, the area's population grew, largely due to an influx of soldiers engaged in the Rogue River Indian Wars. The village of less than 500 residents became a terminal on the stage coach line that ran between Sacramento and Portland in 1864. Roseburg was connected to the rest of the world by telegraph. The first wood burning locomotive of the Oregon & California Railroad arrived in 1872. The coming of the railroad attracted laborers, mechanics, engineers, conductors and others. In 1872 Roseburg was officially incorporated. When incorporated the town consisted of five churches, twelve saloons, three hotels, seven fraternal lodges, two grist mills, stables, harness shops, dry goods stores and a brewery. Aaron Rose's dreams were becoming a reality. From its founding to the present day, Douglas County's greatest wealth has been its forests. At the timber industry's height, following World War II, there were 278 mills operating in the county. Most were cutting timber, all were dependant on some of the largest old growth timber stands in the nation. The fertile, lush valleys of the Umpqua have always yielded a wide variety of crops and nourished livestock, making agriculture the area's second largest industry. An increasing number of visitors are discovering the wealth of natural beauty and recreational opportunities available, creating new businesses and jobs in the area. New residents create a continuing demand for construction services and expanasion of the availability of other products and services.